After a month filled with candy hearts and boxes of candy chocolates, it’s no wonder the American Dental Association dubbed the month of February National Children’s Dental Health Month. Because once the glory of tasty Valentine’s Day sweetness wears off, you don’t need to be a kid to realize how not-so-sweet those candies were for your pearly whites. As the candy-fueled madness comes to an end, step away from the Sweethearts and focus on how to keep more than just their sweet tooth in top shape. 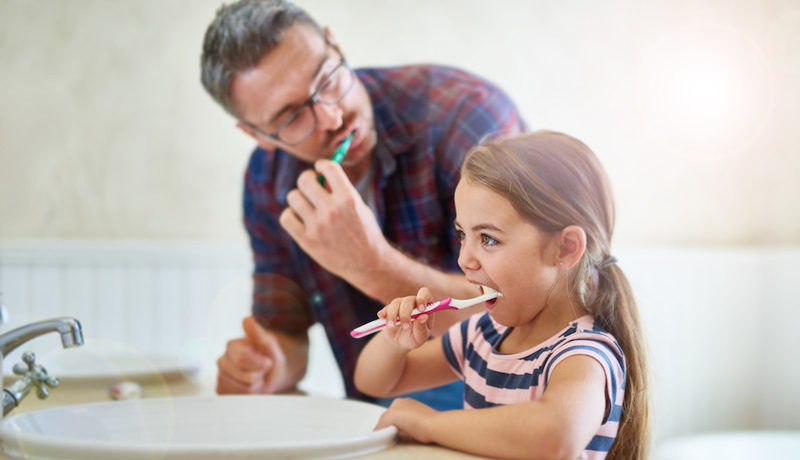 Dr. Michael Suchar, Clinical Director at the Department of Dental Medicine at St. Christopher’s Hospital for Children, shares the best practices for getting kids hooked on brushing, flossing, and smiling like a champ. You already know your kiddo’s first dental visit should be before their first birthday or about six months after their first tooth appears, but what you might not realize is that brushing can start even before their first baby tooth. Make time around the sink more fun by letting them pick a toothbrush that’s a fun shape or a favorite cartoon character that makes them excited to reach for the brush. Turn up music and let them listen to a favorite song as they get ready for the day. Plus, if their favorite jam is two minutes (or more) you’ll be able to ensure they’re hitting the dentist-recommended amount of brushing time. Here’s a hint to make it happen: Have them take a seat on the couch or on the bed while they brush, says Suchar. This way you’ll isolate at least half of their movement, and get in optimum brush time. It’s easy to get a little overzealous with a full tube of toothpaste when you’re a toddler. But, kids ages 3-6 only need a pea-size amount of fluoridated toothpaste on their brush in order to scrub properly, says Suchar. If your child is younger than three, help them squeeze a rice-size amount on their brush. Minty flavors aren’t always appealing to pint-sized palettes. Make sure the toothpaste you pick out for your little ones isn’t a strong flavor that might cause a burning or tingling sensation. A smoother flavor will encourage them to brush rather than be scared of a bad taste. As soon as tiny teeth start to touch, it’s time to reach for the floss. Brushing, flossing, and using home fluoride rinses on a daily basis are key ways to help promote strong, healthy teeth as your child grows. When it comes to strong teeth, brushing is just one part of the equation. Proper nutrition makes up for more dental health than you might think. Keeping fruits and vegetables on hand for healthy snacks versus candy, cakes or potato chips is key for building strong bones and teeth, says Suchar. You never outgrow a perfect smile. Take the lead and brush alongside your children as they get ready for the day. Showing them how important the habit is to you reinforces why creating the habit is so important for them to learn today. Plus, joining your child at the sink ensures you can check for any dental issues before they get too serious. Keep an eye for any tooth discolorations, mouth bleeding, swellings, or damages that might result from chewing or playtime. Alert your doctor if you notice any abnormalities. While milk and all natural juices might be super nutritious, it’s important to stay away from sending your child to bed with them, says Suchar. Milk sugars—from formula as well as natural milk—can settle on teeth and cause decay. Just like making daily brushing fun is important, so is making a trip to the dentist a good experience. After all, they’ll be visiting at least once a year for annual check-ups. Find a doctor who makes you and your kiddo comfortable being in his or her office and schedule their first visit prior to their first birthday. To find a dentist closest to you, visit the American Academy of Pediatric Dentistry’s online search. For more information on creating healthy habits and fostering healthy kids, visit St. Christopher’s Hospital.